There are a number of reasons why people may not want to have anything to do with your social media marketing attempts, but one of the most common is trust. You simply don’t have the credibility to reel people in. Creating trust does not happen instantly and unlike many other marketing factors has to be achieved the old fashioned way. In that we mean from friends, colleagues and customers. Even if you are trusted offline, the online world is a different place. So, here’s how to establish your business as a trusted source and increase your social media success. Becoming an authority in your chosen field will get you the attention you deserve. If you are ahead of the rest of the pack in a specific area you can use it to show yourself off as an expert and become the go to person in that area. Of course, never fake it and never try and pretend you’re something you’re not. The internet’s vast reach will see you unfurled with the click of a mouse if you do. Proving this means showing proof. Use your blog to share your ideas, as well as other content such as testimonials, customer reviews, comments from other renowned leaders in the field about your business and links to your work and content among other things. All of these provide authority and build trust. If you want to be trusted then you have to live, breath and eat what you do. Telling people to do one thing but doing the complete opposite on your own site or blog is not the way to do it. The best way to showcase success is to use your own business as the example. The first thing most people considering hiring you will do is look at your site and social media. If it does what they want their own to do, then you have built a degree of trust. Use your social media presence to provide positive and inspirational advice – don’t just use it to make wise quips or to be negative. Education via social media engages people and gets them on side – do it. Then when they comment, retweet or otherwise make sure you take time out to begin building a relationship with them. By offering more you receive more. Your social media site is not about you, it’s in fact about everyone apart from you. 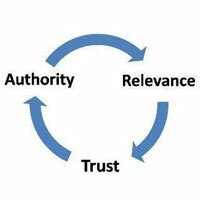 Providing helpful, interesting and engaging content in a natural manner will increase trust. Essentially, provide people with value and you’ll build trust. If your web page is as bland as sheet, then you won’t experience many conversions or have many people joining your social media pages .Try and make your on-site forms, social share buttons and everything else as appealing as possible. If new-comers on site see high engagement levels and appealing buttons, this will increase their trust when they come on-site and this in turn aids their engagement. If your analytics show people are coming on-site but not engaging and you can’t figure out why, a fresh pair of eyes always helps. Have a third party take a look and let you know whether they would want to engage with you, your social media campaign and your site. Trust is almost everything with social media – so use it to your benefit. Need help with your social media strategy? Hire us today! We are very friendly and have tea. A lot of tea.